What's the deal with jazz? Why a BuzzFeed writer secretly deleted her post in shame. 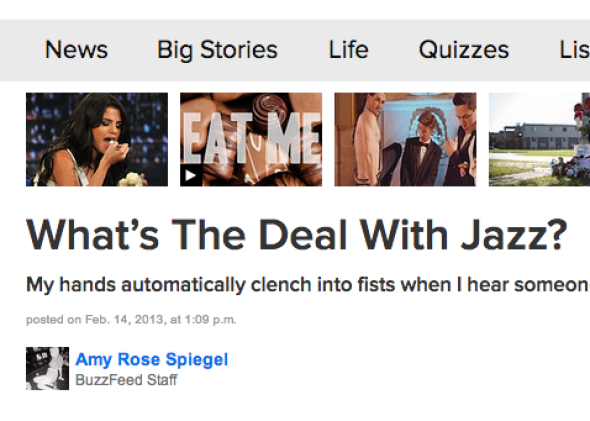 BuzzFeed writer Amy Rose Spiegel says she was “embarrassed to have written” this post. As I wrote earlier, BuzzFeed has been taking heat for deleting thousands of old posts earlier this year without telling anyone. (Gawker’s J.K. Trotter was the first to report on the purge.) The site’s founder and CEO, Jonah Peretti, told me that, as far as he knew, all of the deleted posts were published prior to December 2011. That’s when, in his mind, BuzzFeed morphed from an experimental tech startup into a bona fide editorial operation with the hire of Ben Smith as its first editor in chief. You can read his full explanation here. In the story, though, I also pointed out at least one embarrassing BuzzFeed post of more recent vintage that fell down the memory hole. It was headlined “What’s the Deal With Jazz?”, and the author was Amy Rose Spiegel. At the time of its publication in February 2013, it was roundly ridiculed by other journalists on Twitter. At some point along the line, unbeknownst to the public, it disappeared from the site. As Trotter pointed out, an Internet Archive lookup suggests it was taken down sometime around July 2013, long before BuzzFeed’s methodical purge of thousands of older posts. If it were true that BuzzFeed has been secretly deleting more recent stories as well, that would puncture Peretti’s explanation. Well, here’s one mystery solved: BuzzFeed spokeswoman Ashley McCollum told me Thursday afternoon that the culprit was none other than Spiegel herself. “The author of that post, who no longer works here, deleted it without notifying anyone,” McCollum said in an email. “It has been reinstated and an editor’s note has been added.” Sure enough, you can now find the post back online at its original URL, right here. Happy hate-reading! Why would a blogger delete her own post without telling anyone? Her answer is one that a lot of young online journalists can probably relate to, even if they wouldn’t have taken the same action. I imagine it might resonate particularly with those who have come of age at a time when the industry’s incentives skew toward page-views and Facebook likes. 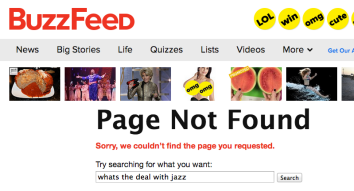 This is how the article page appeared until Thursday, when BuzzFeed republished it. In fact, Spiegel went on, the post wasn’t exactly her idea in the first place. At the time, she was 22 and had been out of college for less than two months. BuzzFeed had hired her as an associate editor for its new music section the day after she graduated from Pace University with a degree in English literature. BuzzFeed declined to comment on Spiegel’s claim that she was bullied into writing the post. *Correction, Aug. 15, 2014: This post originally cited and linked to the wrong Spiegel post about The Replacements.